Is this man who brawled at Center City Sips in 2017 the same man who brawled in a Ritz-Carlton in Aruba on Christmas Eve? Did you catch that viral video of American tourists brawling in the lobby of a Ritz Carlton hotel in Aruba on Christmas Eve? If not, you can delve deeper into this important incident here, here or in the compare-and-contrast videos embedded lower in this post. At several points in the 51-second clip, a woman is heard yelling, “What is going on?” Her dialect is distinctly Philadelphia-region. Because of that – and supplemented by a photo I found on Facebook of a local family in Palm Beach, Aruba at the time of the Christmas Eve melee – I’m inclined to believe a story that an anonymous tipster shared with me this week. Specifically, the tipster offered the name of the Bryn Mawr family believed to have been involved in the incident. Unable to help verify this information was the swank hotel itself, which wasn’t about to drop a dime about the identities of its patrons. Calls and emails to members of the family seeking confirmation went unreturned this week, so I will not publicly share their names here. Moreover, Aruban authorities did not immediately answer questions as to whether anybody was locked up there, either. But it’s obvious that members of the family named in a Facebook post on Christmas Day by an Italian restaurant in Aruba – "what a nice & pleasant family" – and those in the Ritz Carlton brawl are one in the same. Y’all ready for the localized twist? 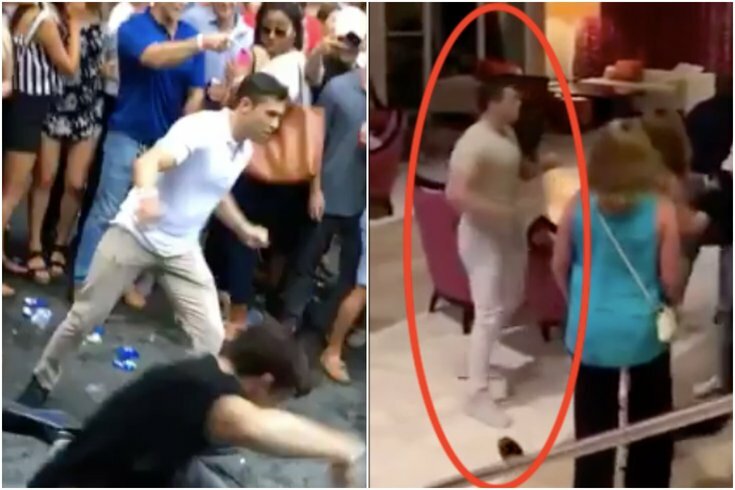 Per the tipster, the brawler who landed that sucker punch in the Caribbean was also allegedly captured on film in the infamous Center City Sips Brawl of 2017 (sporting a white shirt, tan pants and wild aim). 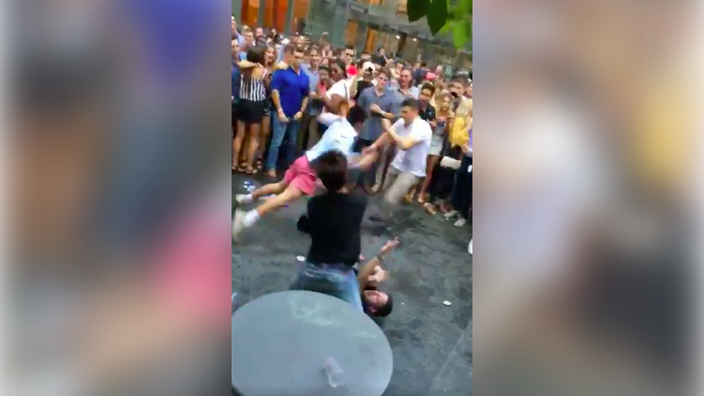 This screenshot of a video taken by Eric Neefe shows a fight that broke out outside a Center City restaurant. Also, Center City Sips brawls did make the top tweets list in 2018. As nobody was charged in connection with the Sips brawl, there is no way to confirm the participants’ names to those involved in the Aruba scrap. But you’re darn-tooting right that this information prompted me to do a “back and to the left” investigation. The results? Yeah, the Ritz-Carlton Sucker Puncher could very well be the same guy who brawled with the man in salmon shorts outside the Comcast Center. Take a look for yourself and see what you think.